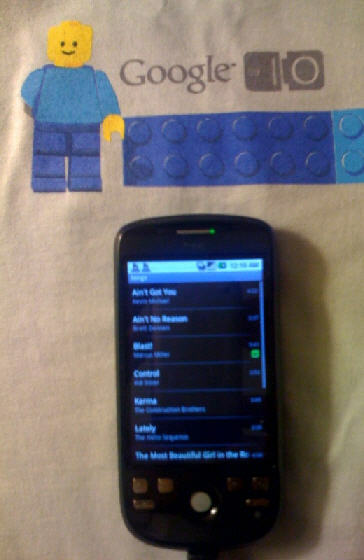 The HTC Magic smartphone is one sweet Google Android mobile computing device. 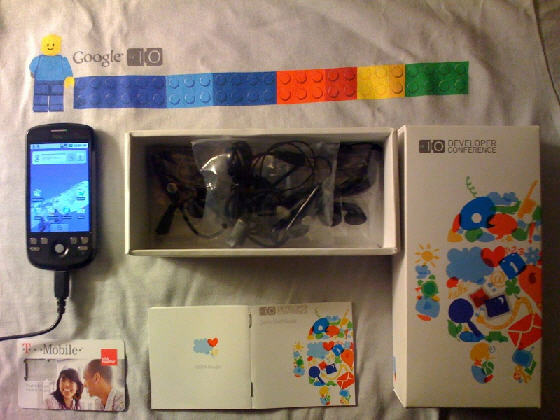 The fact that Google gave all of us who are attending the Google I/O 2009 conference here in San Francisco an HTC Magic makes it even sweeter. Here's what we got - the HTC Magic and all of its associated parts (charger, ear bud phone controls, etc. ), a 2 GB micro SD card, as well as a T-Mobile phone card with thirty days of free unlimited calls and 3G data service. See the full package pictured against the conference t-shirt below. When I started it up, it went through a setup routine that automatically connected it to my Gmail and everything else. And if that's not enough for you, those thoughtful googlers loaded it with a bunch of great tunes. YouTube™, Gmail™, Google Maps™, Google Talk™, Google Calendar™, Google™ Search. High-speed 3.5G network connection and Wi-Fi technology with seamless transition to open networks. Capture video or stills - the choice is yours on the auto focus 3.2 megapixel camera. Easy viewing of PDF files and Microsoft® Word and Excel® documents via included PDF Viewer and Quickoffice applications. Support for Bluetooth wireless stereo headsets (A2DP). 3.2-inch touch-sensitive screen with HVGA (320 X 480 pixel) resolution. The reason I'm writing about it here, on a science and science fiction website, is that although I love my iPhone, I've got a serious beef with it, and with Apple. You see, the iPhone would be the coolest computer I ever owned, bar none. Think about it - it's that amazing. I can't program it! I can't even put tiny BASIC or something on it to write my own software. And if I can't write software for it, if I can't program it, then it's not MY computer!. As turns out, it's Steve Jobs' computer. This Google Android smartphone, on the other hand, is unlocked and ready to accept any programs I might care to download to it. It's my computer, in a way that the iPhone can never be. So you science fiction mavens might be thinking about the pocket computer from Niven and Pournelle's 1974 novel The Mote in God's Eye or maybe the calculator pad from Isaac Asimov's 1951 novel Foundation in relation to the HTC Magic Google Android smartphone. I'm thinking that maybe this is the most remarkable pocket-sized computer I ever owned that's really my computer.